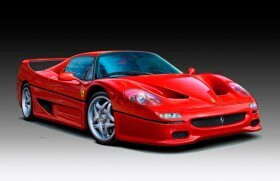 Ferrari built the F50 super-car between 1996 and 1997 as a limited edition with only 349 cars. The two-seater offered pure racing technology. Its V12 engine with a displacement of 4.7 litres, a cylinder bank angle of 65 degrees and five valve technology had already proven itself in Formula 1. Systematically developed composite materials were used in the chassis and body in order to save weight . The front air ducts, side air intakes and wide curved wind-shield optically emphasise the cars racing sport origin. Many curved surfaces and the dominant aerodynamically shaped rear wing form the basic body shape. The 520 brake horsepower road going racing car offered a top speed of 325 km/h (201 mph) and an acceleration time of 3.8 seconds from 0 to 100 km/h (62 mph).